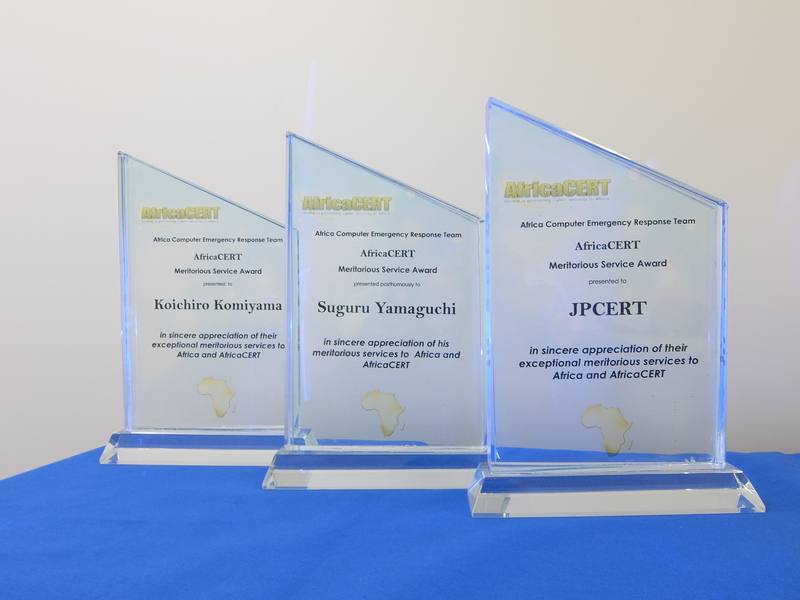 On 3 June 2016, AfricaCERT Meritorious Service Award was given to JPCERT Coordination Center, Dr. Suguru Yamaguchi (posthumously) and Koichiro Komiyama (Senior Analyst, Global Coordination Division). Cyber attacks originating in countries and regions where systems and technologies regarding information security are under development are the impacting threats for Internet users in Japan. Since 2010, in preparation of an increase in incidents in the African region as a result of rapid growth in Internet usage, JPCERT/CC has been engaged in supporting CSIRT establishment and operations as well as human resource development in the region. This has been aimed to build a base for training and collaboration in the region so that when an incident does occur, it can be responded to quickly and smoothly. The award was given to JPCERT/CC in acknowledgement for pioneering and contributing through such activities for supporting the African CSIRT community and its human resource development in Africa. AfricaCERT is a community of the established CSIRTs (Burkina Faso, Cameroon, Cote d' Ivoire, Egypt, Ghana, Kenya, Mauritius, Morocco, South Africa, Sudan, and Tunisia) and cyber security related organisations in all over Africa. The organisation aims to promote information sharing on Internet security and to develop CSIRTs and human resources through series of trainings and conferences in the African region.